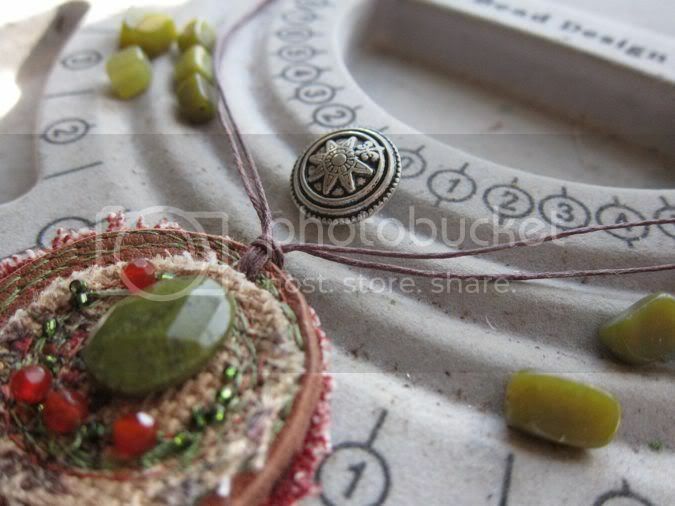 Studio Waterstone | Lori Plyler Art: a necklace tutorial and a giveaway! a necklace tutorial and a giveaway! recycled leather - a small scrap about 3" x 3"
I used a scrap of leather from an old handbag to make the leather cuff. 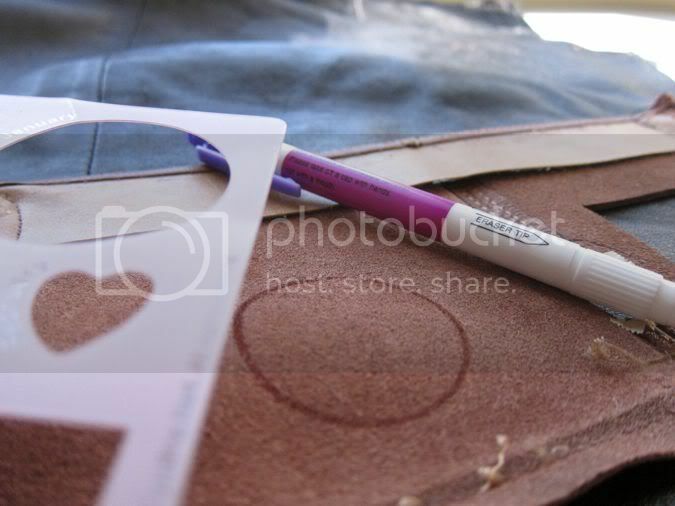 This week I'm using the same piece of leather. 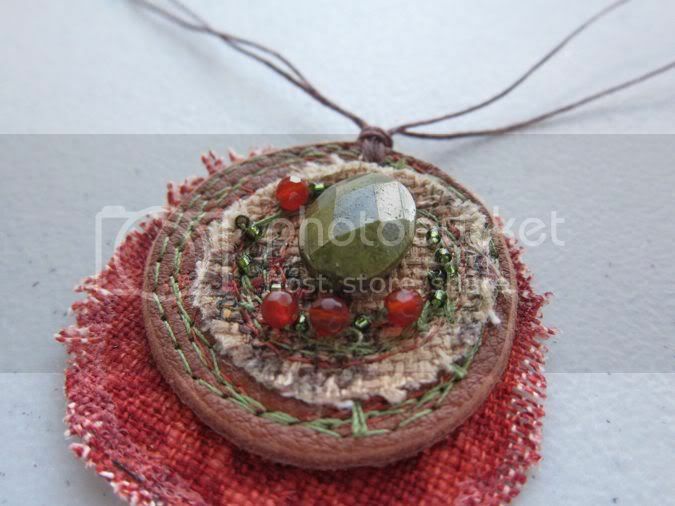 Draw a circle on the backside of the leather - mine is about 1 5/8"
Gather your scraps and stones. 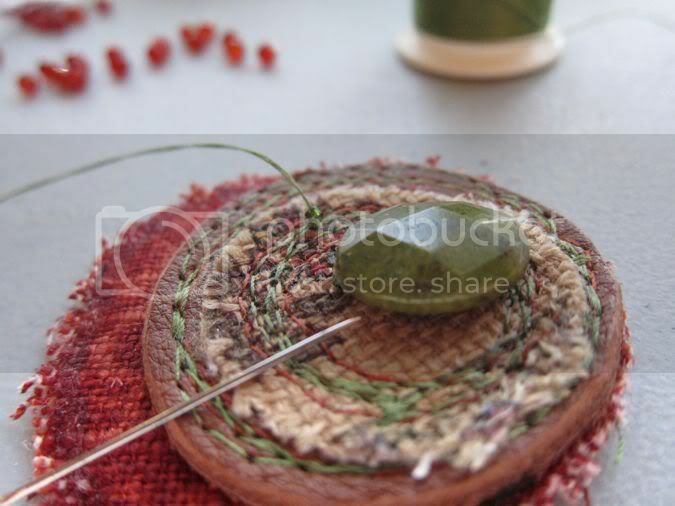 Cut a couple of different sized circles from your fabric. 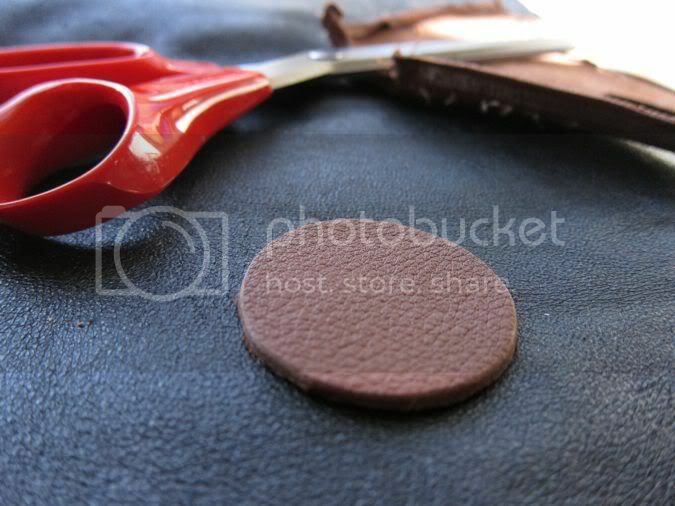 I cut one smaller than the leather and one larger. 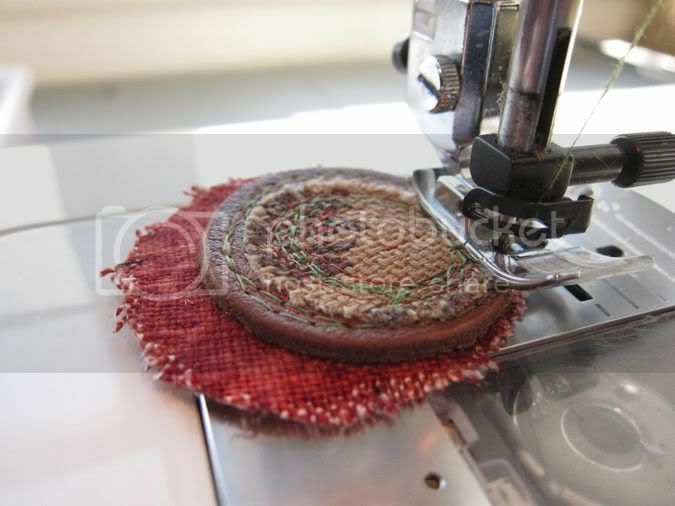 I prefer to stitch with a contrasting thread and make it a little messy and whimsical. Scratch up the edges of the fabric a bit to ravel and then use your Fray Check. 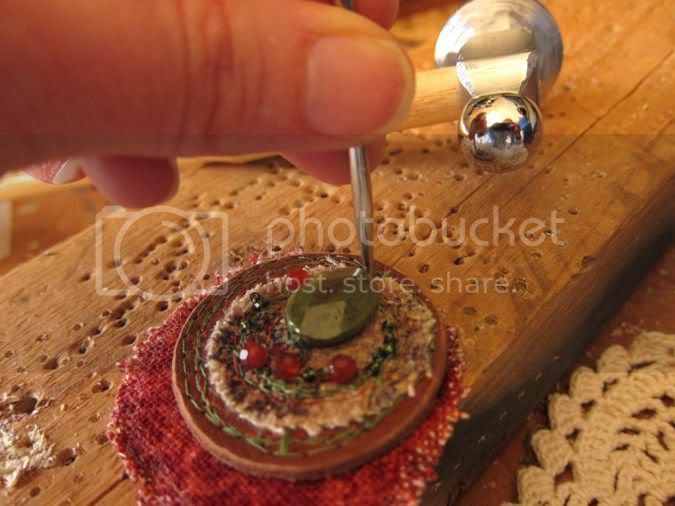 Attach your stones and beads now with the needle and thread. Time now to poke a hole through the upper part to attached your necklace. 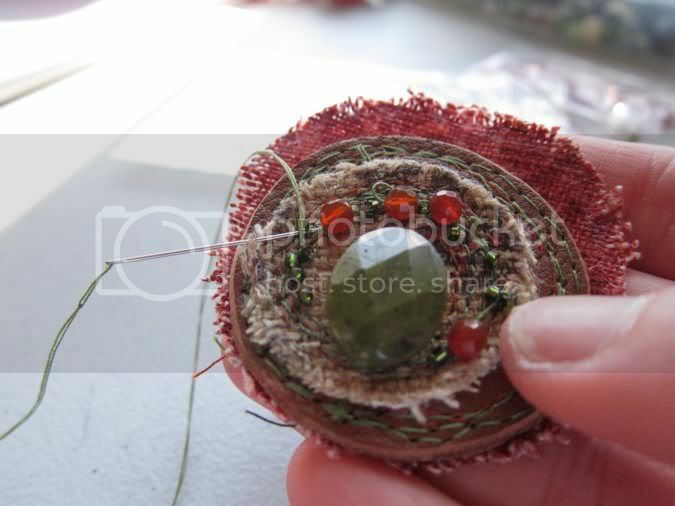 ...pull the thread back through the hole. Pull tight and separate two strands on each side. 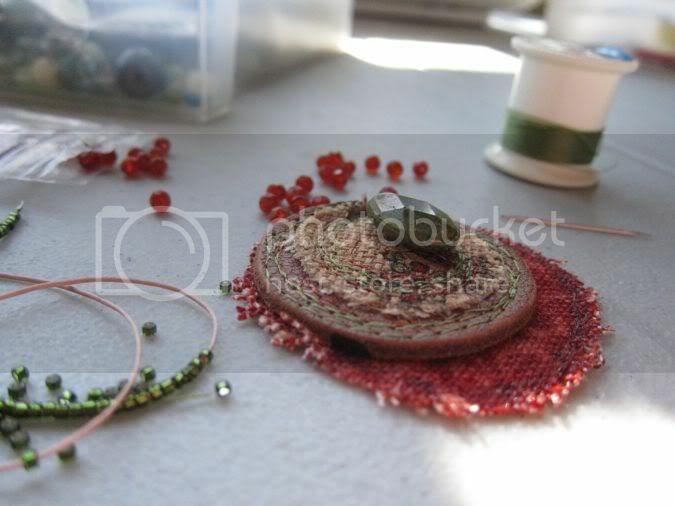 I begin threading my beads and knotting the twine. 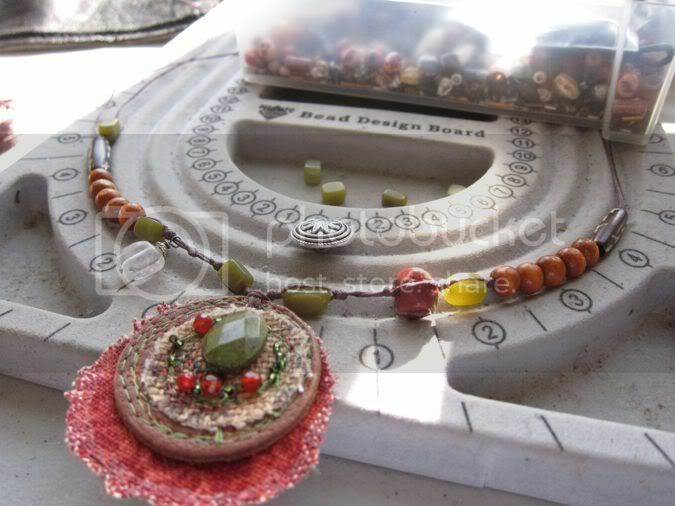 I'm measuring for an approximate 18" necklace. See the button? 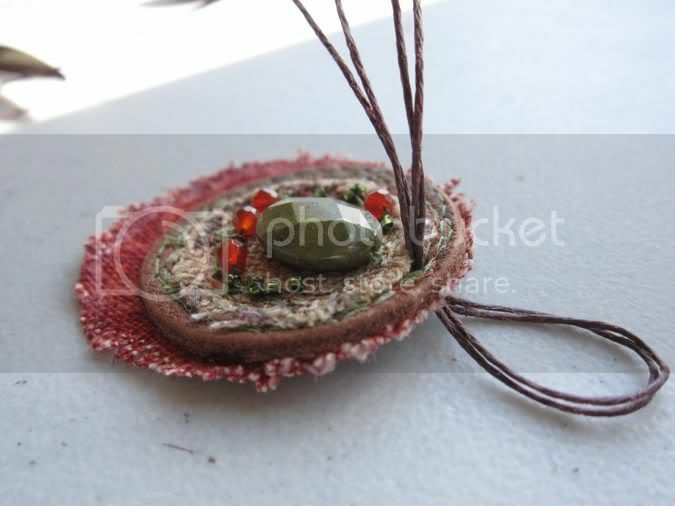 I tie it onto one end and tie a loop onto the other end to create the clasp. super cute! Love your tut, but I'd rather win yours than make my own. I am now a follower! Well..... i'm a loyal follower of your blog... have been for a while, I really Like you on facebook and i shared your facebook post thingy on my wall. What a great tutorial! You have me looking at old leather in a whole new way! I would love to win this thank you very much!!! I am a new "liker" on facebook! Already a fan! I did post on my facebook page! Whoopie! 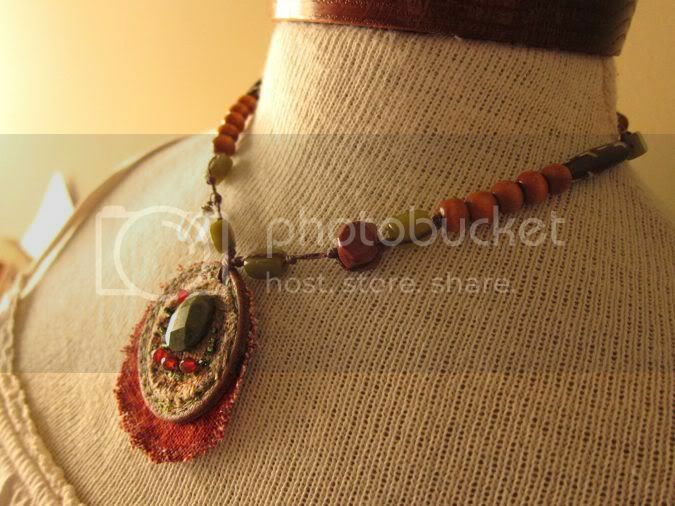 What a lovely necklace...a very creative way to use up scrap leather! Count me in on your giveaway! I love the organic feel too! Simply fabulous! I like your FB page. I also "shared" your link with my personal friends. However, I'm not sure how to link my post. following WaterStone .. love this necklace. You make it look so easy to do. I "like" you on Facebook 'cause I really like your designs and your recycling mentality. Thanks for the terrific tutorials. I have been following but now am doing it officially. Thanks for the chance to win. What a gorgeous focal! 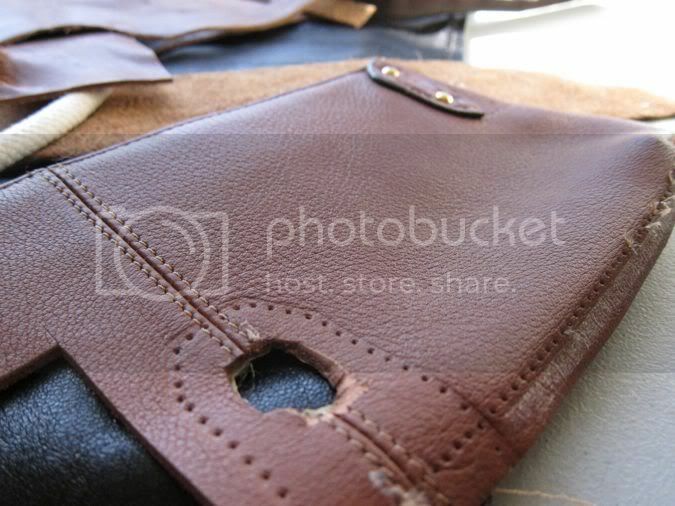 I love that you use recycled leather in your piece! I'm now a follower! Yippee! That is a beautiful tutorial. If only I knew how to sew. 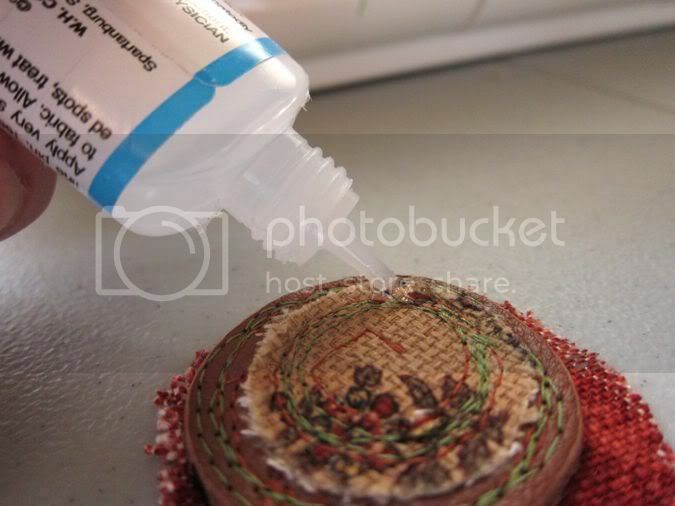 Can I use a glue gun or duct tape? teehee! I could totally see this necklace being sold at Anthropologie! Maybe they will be knocking on your door? what a fabulous tutorial! I'm a follower! What a lovely necklace. I've followed your blog now and know I'm going to enjoy it! Love that necklace! I made something similar for a challenge about two weeks ago. 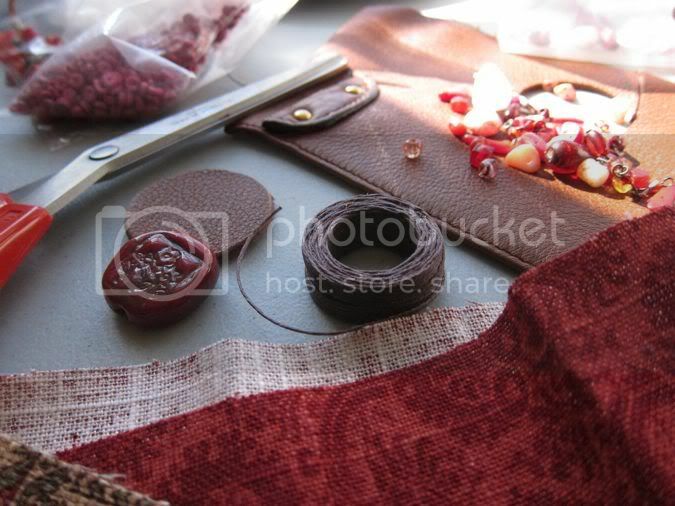 Fun to use all those leather scraps I have. :-) I became a follower. Liked you on FB, too. Fun things you do with leather. Off to browse your blog some more. 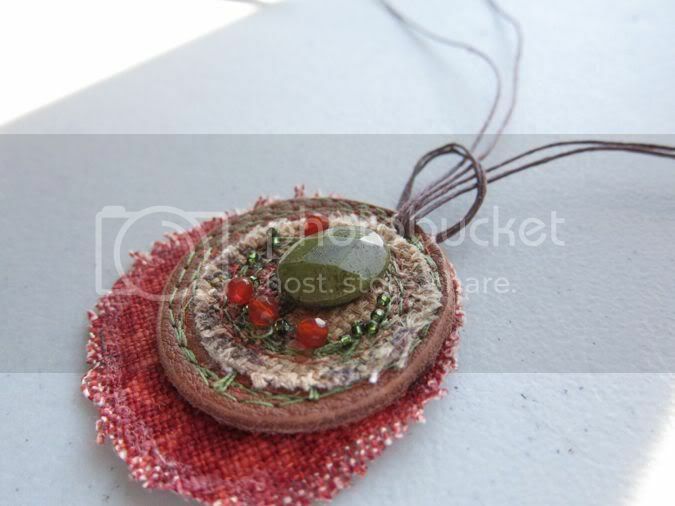 I love this necklace the finished project and the inspiration. What a great tutorial! If only I liked my sewing machine. I am a loyal blog follower. And...I am a liker on Facebook! I posted about this on Facebook too! Now I'm a follower on your facebook! Marge B.
I love the tutorial and will definitely give it a try! Wanted to wish you good luck with all of the changes happening in your life. Blessing to you in the coming weeks! Love the necklace and all of your work. Follow your blog and like your FB page and follow that. This is really gorgeous, and I love the tute too! Thanks so much for the chance! Okay, I posted on facebook and my blog with links.....I just love this, and your products our beautiful! Love to try my hand at the give away! I just "liked" your FB page as well. Looking forward to catching up on your blog. This is my first visit! I'm not a follower but I am now! I can't believe it took me so long to jump on board. Thank you for the tutorial! but I hope I win so I don't ahem....actually have to use my sewing machine. It is evil and sometimes I hear it growling in the closet. And I liked you on FB! oh my..this is really beautiful! thanks for sharing your "how to"! Inserted your tutorial and giveaway on my blog. 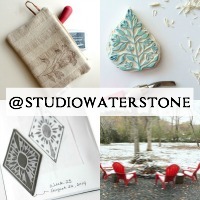 http://rtbrnthnkng.blogspot.com/2011/02/giveaway-alert-studio-waterstone.html Loved your piece. You did a great job on presenting your tutorial, the projectory of the images are great. Oh my gosh! this is gorgeous! Love it!! Love the necklace - your ideas are always so uniquel. I am now a follower. Wow- what a beautiful necklace- I will definitely try this. What kind of sewing machine do you have- mine is kind of wimpy. Just found you through Livewire Jewelry. I am thrilled at a chance to win that lovely necklace. Thank you! I like, and I talked about it. Hope to win the eco-friendly, recycled goodness! 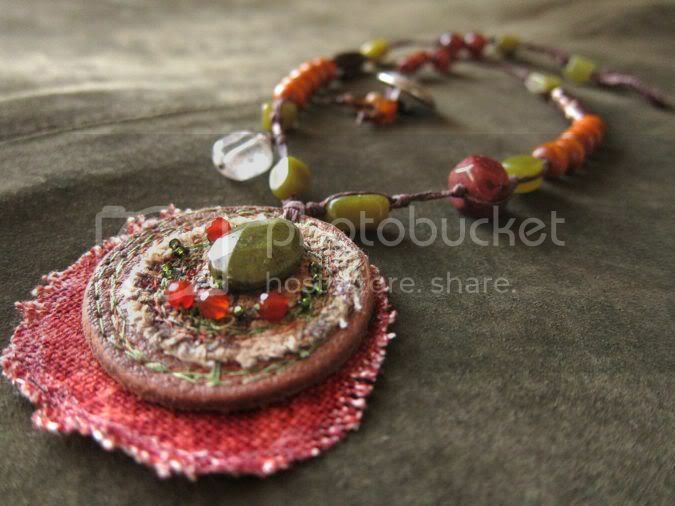 Gorgeous necklace- thanks for the wonderful tutorial- I think I am going to try one- but I would like to win yours too. I am a new follower of your blog. And I "liked" you on facebook too. Wow, what a beautiful necklace! This is my first time here - I came via LiveWire's blog post. Thanks for the tutorial - I will have to try it out!